An Israeli air strike on a car in the north of the Gaza Strip has killed Hamas rocket expert Adnan al-Ghoul and an aide travelling with him. Mr Ghoul was among Israel's most wanted and a Hamas spokesman vowed "painful" revenge as crowds milled around the mortuary where his body was taken. Two missiles were fired at his car near a mosque north of Gaza City. An Israeli helicopter later attacked the home of a local leader of a smaller group in Gaza, but nobody was hurt. Palestinian Cabinet minister and spokesman Saeb Erekat condemned the killing, which he said "reflects the determination of the Israeli government to continue the path of military solutions rather than negotiations". An engineer and alleged bomb maker, Mr Ghoul was described by Israel as "the father of the Qassam rocket" - a rocket Gaza militants have fired frequently into Israel. Stopping such rockets was the stated aim of a recent massive Israeli operation in northern Gaza. The BBC's James Reynolds reports from Jerusalem that Israel has targeted all leading members of Hamas in the Gaza Strip in recent years. Those left at the top of the organisation are in hiding and on the run and Israel believes its military action has succeeded in significantly weakening the movement. According to B'tselem, an Israeli human rights group, more than 175 members of Palestinian militant groups have been the victims of what Israeli officials call "targeted killings" since September 2000. At least 100 Palestinian bystanders have been killed in the course of the killings, the group says. Adnan al-Ghoul had been on Israel's wanted list for over 15 years and had survived three attempts on his life. The missiles - possibly fired by a drone or aircraft - struck as dozens of people were leaving a nearby mosque after evening prayers. Hamas spokesman Musher al-Masri confirmed to the Associated Press that Mr Ghoul had been killed. "It's a new crime committed by the Zionist occupation government against one of the leaders of the Palestinian resistance," he said. "The Zionist enemy will regret this awful crime." 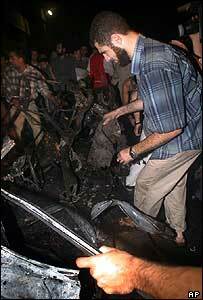 Hamas member Imad Abbas was also killed in the attack. Two other people are reported to have been injured, one of them seriously. At least one Israeli missile hit the home of Amer Qarmout, a local leader of the Popular Resistance Committees (PRC) group in the northern Gaza Strip, on Thursday night. Nobody was hurt in the attack, which Israeli sources said had destroyed a weapons workshop. The PRC earlier said it had fired home-made Nasser-3 rockets into the Israeli town of Sderot. 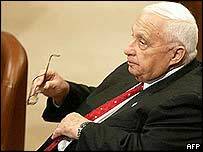 The killing of Mr Ghoul comes just a few days before the Israeli parliament, the Knesset, votes on Prime Minister Ariel Sharon's proposal to withdraw soldiers and settlers from the Gaza Strip. Our correspondent, James Reynolds, says Mr Sharon has made it clear he wants to destroy Hamas before leaving Gaza. Israel has occupied Gaza since 1967. Under Mr Sharon's plan, 8,000 settlers and the soldiers that protect them will leave the strip. Israel will maintain control of Gaza's borders, coastline and airspace, and says it will continue to carry out military operations in Gaza. BBC News: Who are Hamas?